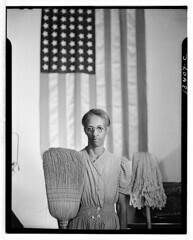 Thoughts after spending 5 hours in the National Portrait Gallery, looking into the faces of Americans from the 18th century to the present day. If I’ve acquired any broadening of perspective from all the hours I’ve spent in the Washington D.C. Smithsonian galleries, it’s this: every life is valid. Everyone has a story. Everyone is “okay.” Although human experience is varied, everything we do, everything we are, has been done, has been experienced before by someone. This is cause for joy. It means that we can’t get it wrong. There is no way to err or truly screw up. All error comes from cultural viewpoints; it’s all a point of view; it’s all relative. And looking back across history in these incredible museums imparts the realization that there are no true successes or failures, no right or wrong in any kind of ultimate, transcendent sense. Everything that could be done has been done (and even so-called new things like space walks on Mars and other technologically aided novelties have existential roots in early voyages of discovery from history). generation striving in the same ways, the “general” of history validates the “particular” of the individual. We lead lives that are different in their particularity (being unique to time, place, culture), but that have been lived before in a general sense. The faint smile of Alexander Hamilton can been seen on people passing on the street outside the National Portrait Gallery. George Washington’s armchair is something we might find in a living room (certainly in any number of attics). FDR’s gaze in a national photo has the same depth and resonance as that of Arthur Rubenstein in his famous portrait. The potential comparisons are endless. There have been artists and explorers and statesmen who were considered successes or failures in their time, but all of them have passed into history. And they were all valid. Death really is the great equalizer and this is a deep relief for someone like me, who has been told he needs to prove his worthiness his whole life. We deify our national heroes, but they were (and are) just talented people. And there is talent everywhere; though, it is not uniformly recognized or rewarded. Essentially, these realizations amount to one basic truth: we are completely free to do whatever we wish because we have the power to define those particularities and the grace of knowing that we are also part of history. How widely we are known and if we are remembered is hardly up to us. Our only responsibility is to remember that we are okay, that we can’t get it wrong, that we are worthy by default. There are no standards of quality that are universal and transcendent. The brilliant short story of yesterday will be disregarded and dismissed today in favor of something else. And those works that “survive the test of time” are great because we can still see their greatness. Our attitudes are what make them great. Otherwise, they are works of art like any others–each with their unique expressions and depths. Say to yourself, “I only need to do my own thing. I don’t need to make any decisions out of desperation because desperation comes from the need to appease some external force or reach some external standard. Beyond satisfying basic needs, I am completely free.” The trouble is that the attitude of having to prove oneself to family and society is pervasive. As soon as we shake it off, we find ourselves unconsciously interpolated back into that dynamic. So our self-work must now be all about living for ourselves, as our authentic selves. Authorship of one’s life is an inwardly focused prospect. It begins first and foremost as a choice of perspective and culminates as an outward way of living. We are all inwardly, which means perfectly, free. Fed watching is a specifically peculiar pastime. Specifically as in: if you take a specific interest in them, they will become specifically interested in you. But it’s all good if you love the government. And I do, as long as the government doesn’t try to love me too hard in return. 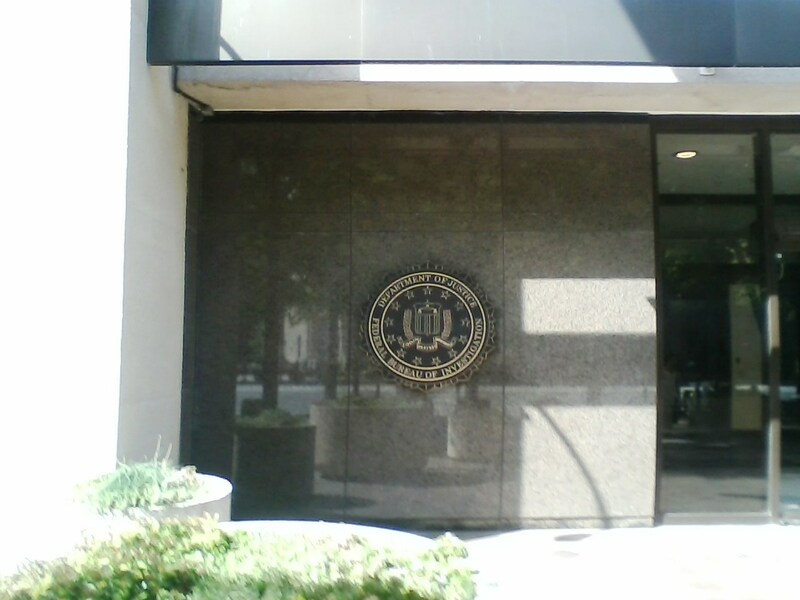 Today, I became acutely aware that drifting by the J. Edgar Hoover Building one too many times might very well result in some hard federal lovin’. It began, as all tragedies must, in ennui and idleness. 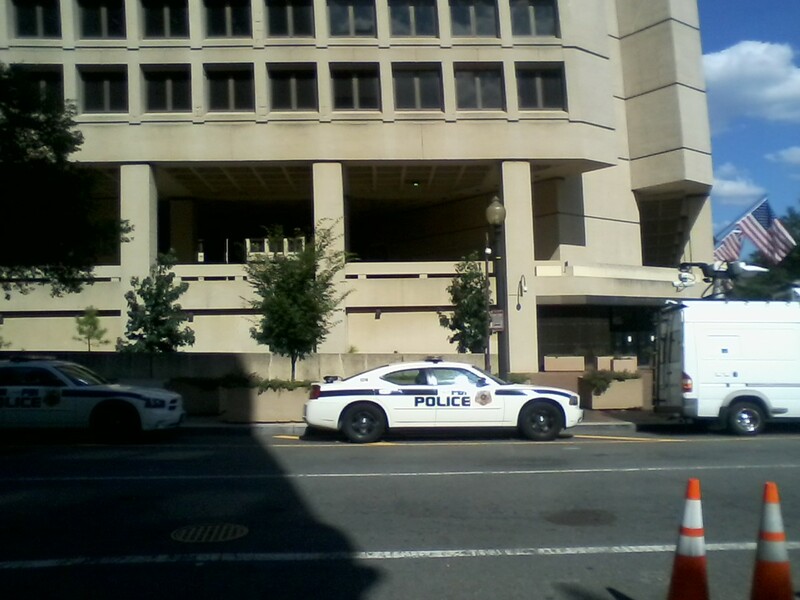 The Department of Justice wasn’t giving tours. Their tourist entrance was dusty, dark, and shamefully unrenovated. It looked like they hadn’t given a tour since 1980. So I did what every good American tourist does when told, “no.” I wandered around and took pictures of everything, looking completely lost and probably pathetic in my rumpled plaid shirt. The truth is in there–in your file. I even went looking for a “spy museum” advertised on a blue sign with an arrow pointing off in the general area of the Washington Monument. True to form, the spy museum could not be found (I should have consulted Google: “50 Years of Bond Villains” and I missed it). But I discovered a way to enjoy myself nonetheless. And, this being D.C., I also learned something. In fact, I learned a lot. 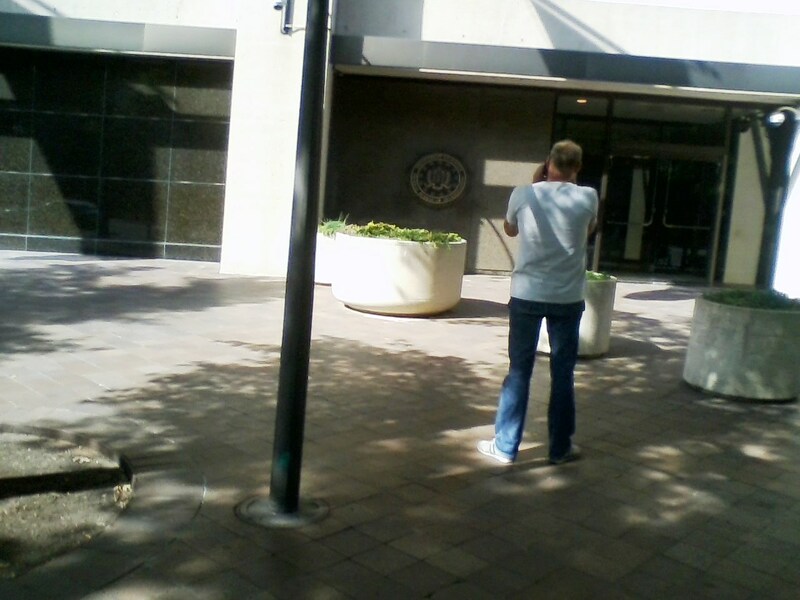 I observed the domestic federal agent in his natural habitat. And it was beautiful. Tired and overheated, I’d made my way back downtown after standing with about 50 Japanese tourists in matching green T-shirts in the Lincoln Memorial. We read the text of the Gettysburg Address aloud together from the wall and then we all clapped. The middle-aged man standing next to me shook my hand. We’d accomplished something together. I felt proud and ashamed. They did an excellent job reading the text, all things considered. Could I do the same with the Sengo-Kenpo? I think not. 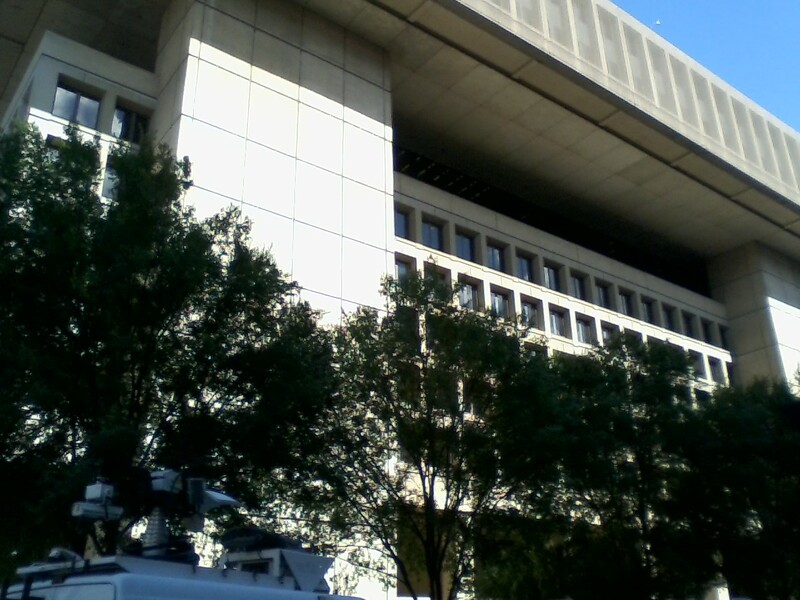 The FBI Police have all their own gear and a concrete fortress. Do NOT underestimate them. In any case, I subsequently found myself back at the intersection where the DOJ kitty-corners the J. Edgar. I arrived just in time to see a lanky southerner of clear conscience but dubious judgment get questioned and patted down by the FBI security police. Apparently, he’d been standing there taking photos of the J. Edgar for some time. What no one knew—or maybe no one cared as I am generally rumpled and clearly non-threatening—was that I had also taken one too many shots of the architecture. Actually, I took more than just one too many. You might say I took a veritable shitload of pictures. And I have no doubt that the intelligence Death Star was taking pictures of me taking pictures since there was a little dome camera every 4 feet. But still, Jethro got the hard love and I got a coffee—across the street. I sat down and started to draft what wouldn’t become this post when I looked up at them coming right towards me—not the FBI leg breaker foot soldiers in white shirtsleeves and body armor, but an honest-to-goodness double Mulder. At first, I thought of Jethro and that maybe he’d gotten off easy, maybe my hard lovin’ would be twice as intimate. But they just sat at the table beside me, oblivious. They looked extremely clean in their unwrinkled blue suits and good haircuts. They looked, in fact, cinematic, unreal, pressed out of some Fed-mint calibrated to make them look more like movie FBI agents and less like humans with nose hair and occasional gas. And then a long silence. I wanted to give them both a big hug for being humans after all—for the nose hair that the Department of Justice must require them to clip, for obviously farting in secret and, in spite of their immaculate suits (which nevertheless looked a bit like Macy’s $150 off-the-rack specials), for being worried about heartbreak. Lots of love in the J. Edgar Hoover Building. It’s obvious, no? I walked away feeling sorry not for them but for Jethro, who will nod off on the plane back to Arkansas, wondering at the faceless tyranny of our federal government, at its omniscience and surveillance. As far as I’m concerned, there’s more to this machine. It’s built out of people. And, as much as it can be a terrifying monster, it can fall in love just like you. Just let it be the gentle kind. I’m hitting that spy museum tomorrow, Moneypenny. Damn it if I’m not. Comments Off on Letter from Washington, Part 2	| tags: Architecture, Department of Justice, FBI, Gettysburg Address, J. Edgar, Lincoln Memorial, National Mall, United States Park Police, Washington D.C., Washington DC, Washington Monument	| posted in Architecture, Washington D.C.